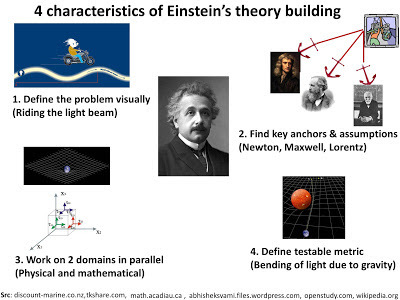 I don’t know why but Einstein’s approach to theory building fascinates me. I have been going back to his biographies from time to time for the past few years. I don’t understand the mathematics of relativity or quantum mechanics. Hence, my understanding about his approach is limited. However, I feel that certain aspects of Einstein’s approach to theory building are accessible to more people. Here are 4 characteristics that I have found useful in my research work which is done jointly with Prof. Rishikesha Krishnan. 1. Define the problem visually: Einstein liked to define the problem he wanted to work on visually – almost like a suspense story. For example, in 1895 at the age of 16 while in a school at Aarau, Einstein asked himself the question, “What would you see if you run after a light wave with the same speed as light?” Exploration into this question would lead him to postulate the special theory of relativity ten years later. In the subsequent years, he would imagine situations where lightning strikes, elevators accelerate in space, blind beetles crawl on curved branches etc. In the context of management of innovation, we imagined three problems associated with an idea funnel: How to build a pipeline, enhance the velocity and improve batting average. E.g. see the picture. This visual imagery helped us understand the problem better. 2. Find key anchors and play with key assumptions: Einstein didn’t sift through tons of experimental data measuring the change in the speed of light. Instead, he went through Lorentz’s book summarizing the results and just assumed that speed of light is constant. Apart from Lorentz, he deeply studied the work of Newton, Hume, Faraday, Maxwell, and Mach. These scientists became the anchors based on which Einstein derived a set of key assumptions. And from these assumptions, he derived the special theory of relativity. For me, the initial anchors were Thomas Edison and A G Lafley. I summarized my findings three years ago in the article & talk: A century of systematic innovation: From Edison to Lafley. For change management part, our anchors were Daniel Kahneman and Heath brothers. Based on their work we could create a framework which didn’t assume anything about the culture of the organization and yet provide a useful approach in becoming more innovative. The only thing we assumed was their intent to build innovation capacity in their organization. 3. Approach the problem on two domains in parallel: Hundred years ago (1912-13) Einstein was busy formulating the general theory of relativity. He was working in two domains in parallel: One, in the physical domain and the other in the mathematical domain. Whenever he would get stuck in one domain, he would turn to the other. He had different sounding boards for each domain – Besso and Lorentz in the physical domain and Grossman and Hilbert in the mathematical domain. 4. Create testable metric: Einstein published a paper titled “Does the inertia of a body depend upon its energy content?” in September 1905. In this paper, like his other papers, he started with grand postulates and principles and derived the famous equation E=mc2. However, he ended the paper with following experiment, “It is not impossible that with bodies whose energy-content is variable to a high degree (e.g. radium with salts) the theory may be successfully put to the test.” And indeed, almost thirty years later, in 1934 Lise Meitner used the E=mc2 equation to explain the energy released during nuclear fission. Like this paper, Einstein had proposed a possible way of testing his theory in his other papers on Brownian motion, photoelectric effect, general theory of relativity etc. I have been a big fan of testable metrics and writing about it since 2010 (simple innovation dashboard, innovation pipeline as a lead indicator metric, 4 indicators idea velocity, weighing scale & culture of innovation). Hope you find some of the characteristics useful. Watch out for our book “8 steps to innovation: From jugaad to excellence” to be published by HarperCollins shortly. Source: The primary source for this article is “Einstein: His life and universe” by Walter Isaacson, Pocket Books, 2008.